Never run out of gift ideas or thoughtful keepsakes for your loved ones and yourself! 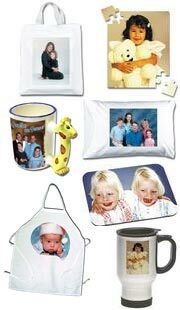 At Mimosa Digital, you get a wide selection of gifts that you can personalize with your photos or any other images (e.g. your child's drawings). You can order as little as 1 for a birthday gift to 500 for wedding gifts. We have graphic designers who can touch-up or execute any design ideas you have, including adding borders, text, or other designs. You are limited only by your imagination! $80/hr re-touching (15 min increments) e.g. removal of stray hair, blemishes, color correction, design, etc. - 4.5 x 6.4 x 1.625"
- 6.25 x 8.375 x 2.5"